Some of them are famous and will be on other people's list of recommended books. There are other books which I have rarely heard spoken of, but they have changed my life. Feel free to comment in the forum below on spiritual self help books that have nurtured you or changed your own life. * A list of articles on this website dedicated to particular spiritual self help books and/or their authors. * Share your own recommendation for A SPIRITUAL SELF HELP BOOK. 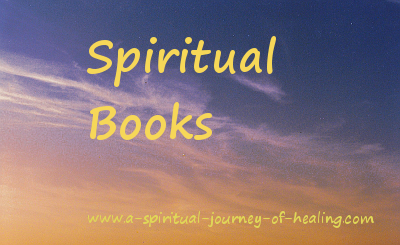 Tell us about your own book on the spiritual journey. Or read books recommended by other visitors. These are some of the books on using spiritual principles that have helped me to experience a life of greater joy and abundance. Whenever I remember to do so, I become aware of what my thoughts are asking for, apply the principles, and ask for more! The Bible is also full of verses we can use to claim claim prosperity. Click through to buy or look through spiritual self help books in the Amazon store. We are always in relationship. Even if we live in isolation, our relationships continue within our mind. The spiritual paradigm gives us radical new ways to ease or solve relationship problems. Please help yourself to my free book on forgiveness which has helped to dissolve many problems in my life, especially at a time when I was too physically ill to avoid or move away from someone! My spiritual journey has exposed me to teachings from many paths. We learn from each other as we let God/the Divine guide us to what is right for us. Joyce Meyer runs her own Christian ministry. She suffered sexual abuse when young, so will be particularly relevant to you if you have sadly experienced the same. Henri Nouwen is a Catholic. His gentle compassionate books are read widely by those of all denominations and none. CHRISTIAN HEALING OF THE ILLNESS MYALGIC ENCEPHALOMYELITIS. The following three books are all memoirs. Grace and Grit - a journey with spirituality and cancer. I thank you for the work of spiritual authors. Feed them with knowledge and understanding so they may always speak words that connect us with Your Love. Please bless them in their life and work, and make them a blessing to others. Following various requests to do so, I opened the forum below to submissions for spiritual author promotion. If you are a spiritual author you can introduce your spiritual books to the visitors at www.a-spiritual-journey-of-healing.com. If a book doesn't look suitable for my visitors, I will not publish your promotional comment. Apologies if the contents are indeed consistent with the message of my own spiritual books and this spiritual website, but I often need to make a quick decision. Please include your email address - the space to do so appears after you have submitted your article. I can then contact you if I have questions. Do you want to share your own favourite (UK spelling) spiritual books or book? You can do so in the box below. Do you have a book to recommend - your own or someone else's - a spiritual book or a popular psychology book. Please say why you think it will be of interest to visitors of this site. Tell us the title of the book. Tell us about the book here.